Director of the film ‘Don’t Cry Mommy’, Kim YongHan has given praise to U-KISS’s Dongho’s acting skills. Director Kim YongHan participated in press conference for film ‘Don’t Cry Mommy’ on October 15, at Lotte Cinema. The film tells a story about a mother who seeks revenge on the suspects who killed her high school daughter. Kim YongHan confessed, “I don’t know idols that well”. 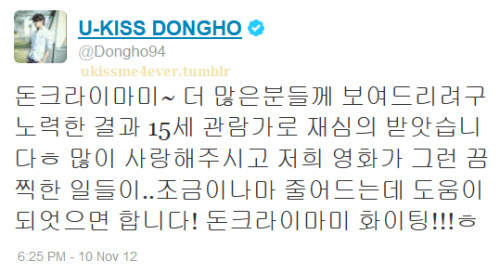 He continued, “I didn’t expect to receive such a big response to Dongho’s character, a minor sexual predator“. In the film, Dongho plays an over-confident high school student, who performs the crime of sexual assault on a female student, Eunha (played by Nam Bora) and does not feel the consequences of his actions. Director Kim said, “Dongho truly acts very well. If another idol had tried, they wouldn’t have been able to as there is a lot of depth in the confidence of the character to make such bold decisions.” “Dongho was just 17 (when filming) the difficult decision, so I and the audience remain very thankful towards him. Dongho acts extremely well. The only thing is, it’s a shame he couldn’t have prepared more due to his busy schedule”.